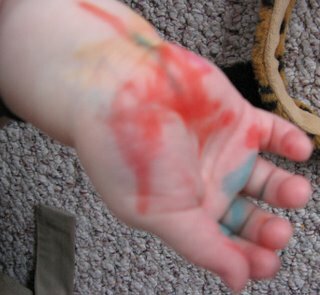 She had climbed up on the big kids art table and was drawing on her hands, her favorite canvas. Gotta love the the need to "art" I wonder where in the world she gets that from? She will eat crayons so maybe markers are the way to go. We gave her a magna doodle, she loves that. Time to assemble toddler friendly and edible art supplies I guess. I wonder when she is going to want an art journal? 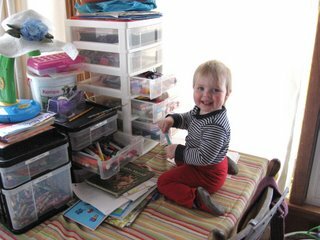 That reminds me, any art journalers out there, there should be a kids book on "how to" art journal, Robyn would love something like that. March 16, 2006 by carol strand.